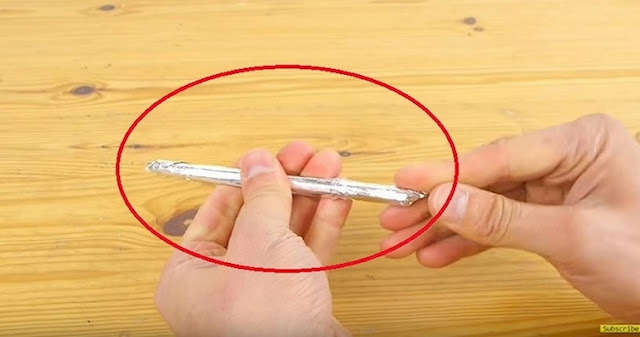 He Starts By Wrapping A Pen In Tin Foil. What He Makes? This Is SO Cool! Sometimes, we could use a helping hand when it comes to our smartphones. In the winter, you don't want to take off your mittens to text and risk having your pinkies become popsicles. Then there are those times when your fingers are not quite nimble enough to play your favorite games or finish the finer details in a Snapchat masterpiece. Luckily, this handy video tutorial will show you how to get the most out of your smartphone and its applications when your fingers just won't do. The answer? This amazing DIY stylus pen for your smartphone. The best part is that this high-tech pen can be made from items laying around your home and will literally cost you a dollar. Find an ordinary ballpoint pen. Cut off a strip of tin foil. Wrap the tin foil around the pen, tearing off any excess. Round the tin foil over the ballpoint at the bottom of the pen. This will be the end that touches the smartphone's screen. Try out your new stylus! It's amazing for touch-controlled games and any drawing application. Here's another tip if you don't want to make this stylus: you can also use the negative end of a discharged AAA battery. Watch the video below for the full tutorial on how to make this DIY stylus, as well as some other awesome smartphone hacks.